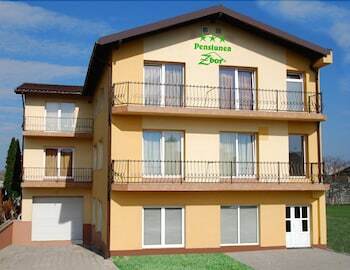 Located in Cluj-Napoca, Pensiunea ZBOR is within a 15-minute drive of Dormition of the Theotokos Cathedral and Iulius Mall Cluj. This pension is 3.4 mi (5.4 km) from Avram Iancu Square and 3.4 mi (5.5 km) from National Theatre. Stay in one of 15 guestrooms featuring flat-screen televisions. Rooms have private balconies or patios. Complimentary wired and wireless Internet access keeps you connected, and cable programming provides entertainment. Bathrooms have shower/tub combinations and complimentary toiletries.